My love for America is shown through my folk art. 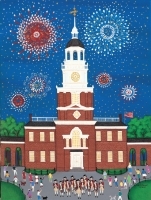 My folk art paintings, limited edition American folk art prints and note cardsproudly reflect the character and charisma found in many of the United States’ most popular cities and landmarks. These happy and detailed images engage viewers of all ages, evoking smiles and pleasant memories. “Celebration”, “joy”, “whimsy” and “humor” are words that I have heard from viewers and I am delighted at this reaction. One eleven-year-old boy exclaimed, “this folk art rocks!” at a recent exhibit. As an American folk artist painting in a contemporary folk art style, I am excited to be able to offer my collection of Americana paintings, prints and folk art note cards. 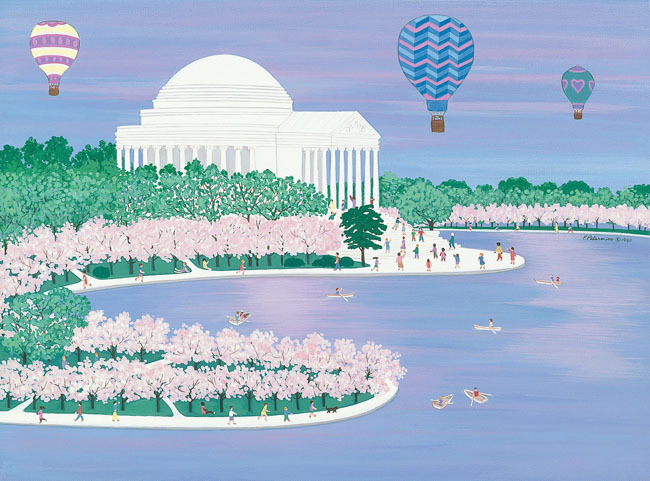 My works are sold in numerous galleries and are in many public and private collections including The White House, the American Museum in Bath, England, the National Horticultural Society, United Card in Tokyo, Japan and others around the world. Folk art has been a tradition throughout the world; it is referred to as naïve art in Europe and peasant painting in England and Asia. After the War of 1812, American folk art became strongly focused on pride and patriotism in the United States and has blossomed ever since. Folk art is portrayed as the art of the people, for the people and by the people because it’s the art that is quintessentially America. I am an American folk artist like the folk artists of earlier centuries. I am self-taught and my paintings are based on narrative using symbolism and humor to tell the story of the painting. The majority of my American folk art paintings and prints portray the American landscape with a strong sense of color, patriotism and locale. Alexandria, Virginia,Washington, DC, New York City and Nantucket are favorite places because of their history and numerous celebrations. Humor also plays an important role in understanding my paintings such as in “Mermaid 10 K Today” and “Flamingo Beach”. I’ve ordred note cards to pick up at your studio. Where is that or can I pick them up at the market Saturday morning? You can absolutely pick them up on Saturday at the market – and I thank you very much for your order!